Colleen Hoover saved my life. That’s a pretty heavy and bold statement to begin with. But I’ve always believed that she has. She really did. About two or three years ago, I felt like my life was quietly spiraling out of control along with my sanity. My world was falling apart and no one’s there to notice it but me. I was battling depression from a failed relationship. It might sound silly to some and even common to others, but for me, the pain I was going through then was like a living hell. It felt like my life has come undone and all the goals I had for myself shattered. It’s the first time in my entire adult life when I felt completely lost. I found myself just going through the motions of living life, trying to function normally when the entire time I was just feeling hollow and numb. It was then I rekindled my love for reading. I wanted to escape my reality and get lost in the world of books instead. I wanted to fill my thoughts with happiness and characters who can come and save the day or seize it for themselves. So I read romance books. Quite unnerving to some that I’ll read romance when obviously it’s the ultimate reason for my pain. But for me, it was a quest. I wanted to see that there are still happy endings, even if they only exist in books. That’s when I stumbled upon Colleen Hoover. A little-known author to me then, a random recommendation from Goodreads. The author who I didn’t know, will make me fall in love with words once again. It was her novel SLAMMED, that made me believe in love again. Not just the romantic kind, but also love for your mother, siblings and family may it be by blood or not. She made me love words and feel life in poetry, it was clear then that she would easily become one of my favorite authors. She saved me from my dark corner and gave me hope. Hope from her stories that I can start over. And that I did. 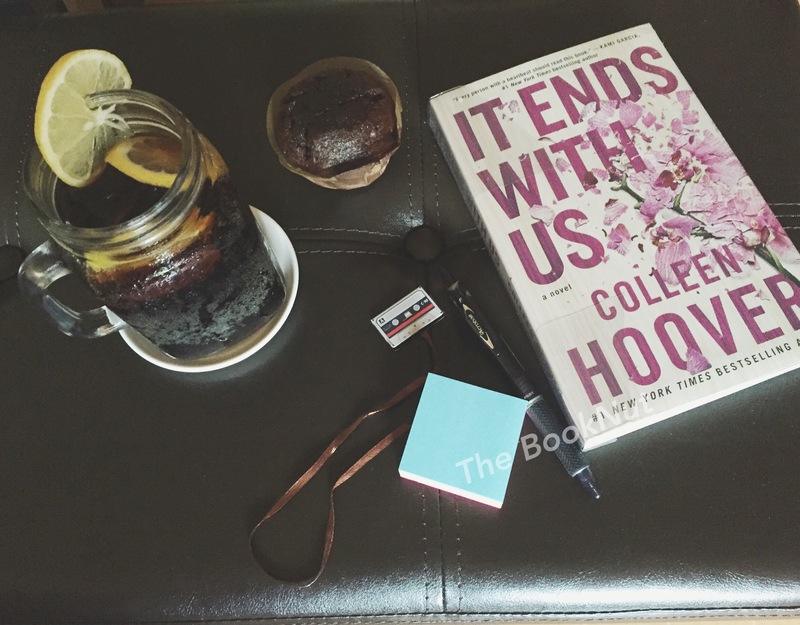 Fast forward to a couple of years and about 16 or so books, I’ve found that once again Colleen Hoover has changed my life with her latest novel IT ENDS WITH US. I’ve always believed that authors give a little piece of themselves in every book, every plot line, every masterpiece. Big or small, an author always lends a piece of him/herself to the story. But you’ll definitely recognize it if a book is so deeply personal for an author. You FEEL it with every string of words and in every turn of turn of the page. That’s what It Ends With Us is. It’s been exactly a week since I read and practically bawled over this book. A week that made me rethink so many things in my life and question what I really know. Let’s just say it’s been a difficult and enlightening week for me. I wanted to write this review when I had the time to sort my feelings out and when I know I’m ready to share a more personal review. Just like Colleen who shared a very personal story, I think this book deserves only that. Naked Truth: I had absolutely no idea what Lily and Ryle’s story is about when I started to read the book. As far as I can remember, Colleen wanted it to be that way. We didn’t have any general idea about the story, even come to the week of the book’s release. The lines and the excerpt she shared to her fan group didn’t shed any specifics as to what the story was about. For all we know it might be just another story about a girl and a boy. Except that, it wasn’t that simple. I even stayed away from her Facebook fan group which I belong to when the book was close to release to avoid reading any giveaways or hints to the story. I found it exciting that I was going to dive in the book blind. Which was scary and refreshing at the same time. Naked Truth: I fell absolutely in love with Ryle’s character. It was hard not to really. The connection and attraction between Lily and Ryle was hard to ignore. He was intelligent, funny and kind (YES, I know!). It’s hard not to feel anything for him when Colleen translated his character so well in the book. Naked Truth: I was in denial when the first blow landed. I was as stunned as Lily. I remember I was yelling ‘NO!’ whilst reading. I kept on chanting ‘This is not happening, this is not happening..’ while re-reading that particular paragraph 2-3 more times, making sure that I wasn’t imagining it. I was as distraught as Lily and just then, I felt my heart breaking for her. All the while I felt Ryle’s sincerity in his apologies, but there was something in my gut too. Something that was hard to ignore. I knew Lily felt it too. Naked Truth: I have no first-hand knowledge of domestic abuse. And back then, I used to think that women who stayed in abusive relationships were too weak to make that decision to leave. But now I know I was terribly wrong. I’m fortunate enough to grow up in a loving home where my father early on has taught me that a man should never lay a hand to any woman in his life. May it be your mother, sister, wife or daughter. Growing up as an only child, he protected and shielded me as much as he can from all the nasty that the world has to offer. I am eternally grateful to him for that. During my teen years, he would always tell me that if ever I decide to have a boyfriend, I should always make sure he is respectful and kind. But most of all he should never ever lay a hand on me. This thought was ingrained to me ever since. I knew in my head that abuse, whether physical, verbal or emotional was going to be a deal breaker for me. So when I started to date and be in relationships, I was lucky enough not to be in any abusive one. That’s why when I was younger, I used to ask myself why so many women choose to stay in abusive relationships knowing that it might one day end their life. Naked Truth: I don’t think I would personally have the strength that Lily had, to make the decision to walk away. I admire her courage. I admire that she was brave and bold. I’m amazed by all the Lilys who fought and overcame their obstacles. It Ends With Us made me face a difficult question, one that I didn’t think would be as hard to answer before. “If I was Lily, will I have the courage to leave?” Something in the story unglued me and made me question everything I know so far. Which I think is what books and stories should do, they should challenge your mind and feelings. Face realities and learn from them. I really felt that Lily’s final decision did not come as easy. This book made me realize that you should never be quick to judge the people who are going through abuse. It made me broaden my understanding and really open my eyes to the reality of things. I might have been a little naive all this time, but Lily made me realize what it’s like to fight for yourself. Colleen Hoover may have just saved my life (again)without even knowing it.